Poor crop establishment is common in developing countries. However, plants can be given a head start if they are able to germinate and emerge quickly. One way to minimize the time that seeds spend absorbing water from the soil is to soak the seeds in water before sowing them. This kind of seed soaking, also called seed priming, has been done in many countries and for many generations, but is only regularly done during poor growing conditions to help seeds “catch up.” Until a few years ago, seed priming was not done on a regular basis, and the duration of soaking varied. Experiments with on-farm seed priming were done by researchers from the Centre for Arid Zone Studies (CAZS) with funding from the Plant Sciences Research Programme of the United Kingdom Department for International Development (DFID). Safe limits were calculated for the length of time that seeds could be soaked without germinating prematurely. Then on-farm trials were done to compare the performance of primed seed with non-primed seed. A booklet by David Harris that describes on-farm seed priming summarized the trials as follows: “The results were remarkable. Farmers reported that primed crops emerged faster and grew more vigorously. This alone is reason enough to adopt seed priming. In many cases, however, crops also matured earlier and gave higher yields. They also flowered earlier – very important in drought-prone areas. 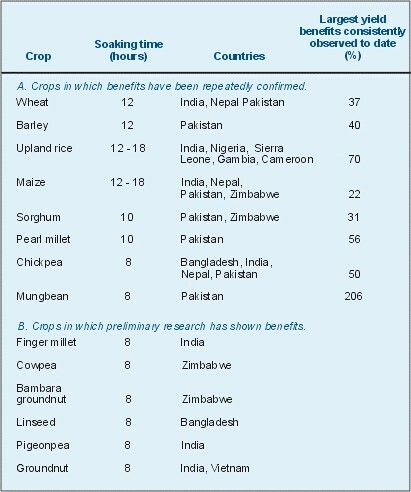 In some cases – in chickpea and upland rice for example – less disease was reported. Priming has become very popular with the collaborating farmers, along with their friends and neighbors, because it is simple and cheap yet extremely effective.” Figure 2 shows the difference that priming seed can make for emergence of maize seedlings. The plants on the left are from primed seed and the plants on the right are from non-primed seed. 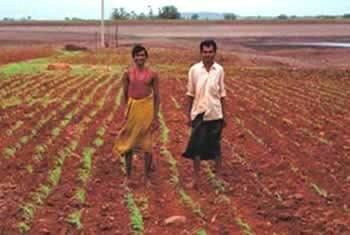 Figure 2: Maize emerges faster and more completely when seed is primed overnight, as shown in this farmer’s field in India. The maize plants on the left are from primed seed. Maize plants on the right are from non-primed seed. Photo by David Harris. Table 1 summarizes crops for which yield benefits of on-farm priming have been demonstrated. Crops listed in category A have been extensively tested; those in category B have shown promise and are being tested further. The table also lists the soaking time (in hours) that has been found to be effective. In general, overnight soaking is safe and effective, but rice and maize show better results if seed is soaked for 18 hours. Table 1. Summary of crops responding positively to on-farm seed priming. Table used with permission; from www.seedpriming.org. Farmers in many countries tested, developed and adapted seed priming, and feedback from them has been very positive. For example, a group of 23 farmers in India were asked for feedback about the effects of seed priming on wheat. All of the farmers felt that the primed seeds germinated earlier, resulted in a better stand of wheat, and matured earlier. 83% saw more vigorous growth and harvested higher yields. 78% saw larger panicles filled with more grain. 65% claimed that plants had more tillers. All of the farmers declared that they planned to soak their seed the following year. This kind of response was typical from farmers in many different countries. Seed priming activities are now being done in more than 25 countries in Asia, Southern and Central Africa, West Africa, and Latin America. Effects of on-farm seed priming have been independent of the crop variety used. In standard methods of seed priming (often done for temperate horticultural and agricultural crops), seed is soaked, then dried back to its original water content. This is both energy and technology-intensive, and results in biochemical changes in the seed. In marginal tropical environments where water is often lacking, the main purpose of seed priming should be pre-hydration of seeds (though it may also result in some biochemical advantages). Properly primed seed still needs additional moisture from the soil in order to germinate. Farmers can prime their own seed if they know the safe limits for soaking (i.e. so that germination will not continue once seeds are removed from water). It can be disastrous to sow pre-germinated seed under dry land conditions! Seed can be primed overnight, surface-dried and sown the same day (but if necessary, surface-dried primed seed can be kept for several days before sowing, if it is kept dry). The fast germination and emergence of primed seed can lead to fast development of seedling root systems while soil conditions in the surface layers are still relatively favorable. For more information about seed priming, contact Dr. Dave Harris at DFID Plant Sciences Research Programme; Centre for Arid Zone Studies; University of Wales; Bangor; Gwynedd LL57 2UW; United Kingdom; Tel: 0044-1248-382922; Fax: 0044-1248-371533; E-mail: D.Harris@Bangor.ac.uk.